The “Rap” one was also really awesome like the “Rock” book with showing a lot of cool rappers. We liked Run DMC and Missy Elliott. Also liked the cool guy with the hat on the cover…we don’t who he is but seems like a nice guy!! This book was very nice and really really cool & informative. We liked the cool pictures of Frida as a cat and they did a great job of showing her exciting life and art. This book is a story about a girl named Birdie, who transforms into Crafty Cat, which is her crafty alter ego. She does this whenever she needs to make something, or to help someone fix something. Birdie makes her Crafty Cat suit out of different craft items whenever Crafty Cat is needed. She has a friend named Cloudy who is a cloud. Birdie wants to be a butterfly because her class is having a bug play about lots of different bugs. She has to prove that she can be as fast as a butterfly, faster than the other kid who wants to be a butterfly. You’d like this book if you like cats or crafts. My favorite thing Crafty Cat can make is bookmarks. If you want to make some too, there’s a craft section at the end of the book! There is also a pattern to make butterfly hair clips, and I am happy this is in the book. I give this book five stars. I can’t wait to get more books to read about Crafty Cat! Summary of the story: It was a bright sunny day in August with a clear blue sky, when Penny awoke. Penny began to roll in the soft, sweet-smelling grass. Penny thought about joining her herd when she heard a strange nose by the river. What did I like? When Penny heard the strange noise. Who else might enjoy this story? Kids who are adventurous and who love horses and who love to read. Summary: Taylor and Tyler set traps so they could win the race. Pop! Pop! There are nails on the track. Then their truck runs out of gas. They steal roller skates and slip on their traps and lose. Who else might enjoy this story? kids that like legos. Summary of the story: This is a story about a girl named Helen Keller who’s blind, deaf, and could not talk. Then she started to hit and kick people and once Helen even pushed her baby sister, Mildred, out of her cradle. Then Annie came to live with the Keller family to help Hellen Keller. She helped Helen learn to talk and do sign language. What did I like? I really liked this story because it’s a real story, and it’s a good story because it’s about a girl who is a super sweet girl, but is deaf, blind, and cannot talk. Overall review: this is the best book ever no wonder I read this book so many times. Who else might enjoy this story? Blind kids . Summary of the story: This story is the story the wolf told Jon Scieszka. The wolf was sick and he was looking for a cup of sugar, but no one gave him one. What did I like? He eats 2 pigs! Who else might enjoy this story? Hunter and anyone who likes the 3 little pigs! Summary of the story: Carlos goes to the cloud forest. Then Carlos sees the animals in cloud forest. 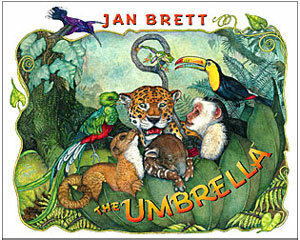 The animals jump in the umbrella. The animals are squished in the umbrella. What did I like? The pictures. Overall review: It is cool!